Living a Fit and Full Life: Meet the Untamed T-Rex from WowWee - Launches on #FerociousFriday 8/3 at Retailers Nationwide! Meet the Untamed T-Rex from WowWee - Launches on #FerociousFriday 8/3 at Retailers Nationwide! Ferocious at Your Fingertips! Friend or Foe? You Decide! 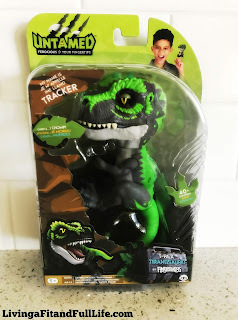 Meet the Untamed T-Rex from WowWee! These finger-gripping "King of the Dinos" creatures are fierce and unpredictable, and know friends vs. foes! In Untamed mode, they roar, hiss and chomp! In Tame mode they nuzzle, purr and love to be near you. Complete with snapping jaws and gripping claws, these interactive dinos react to touch, motion, and sound with over 40 different sounds and animations. There are 4 different T-Rexes to tame and collect! The Untamed T-Rex from WowWee is so much fun! My son was in love as soon as he saw this super fun Untamed T-Rex. He was even more in love when we opened it and he found out that it was interactive. The Untamed T-Rex from WowWee has two modes, untamed mode where they roar, hiss and chomp and tame mode they nuzzle, purr and love to be near you. Their Jaws snap and their gripping claws allow them to perch onto you finger for the most ferocious fun you've ever had! Sold at retailers nationwide starting 8/3! Click HERE to learn more about Untamed! Follow Untamed on social media!